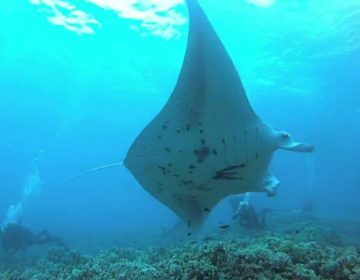 Though many people dream of a tropical island holiday where they do nothing but laze on the beach, lots of visitors to the Maldives are keen to pursue water sports, especially scuba diving for what the islands are justly renowned. Even snorkeling around the reefs is a magical experience and less demanding and a lot less expensive. One activity you can’t try is spearfishing, which is not permitted anywhere in the country. Sailing and windsurfing are available at all resorts, while motorized water sports like water-skiing and parasailing are offered at some of the bigger ones. There are a few areas with good surf, while fishing is available everywhere. Some resorts have tennis courts, badminton or squash, and most will have beach volleyball. The bigger islands have football (soccer) fields, where enthusiastic staff teams regularly trounce the guests. Most resorts also offer ‘island-hopping’ trips and those close to the capital offer excursions to Malé. The marine life in the Maldives is incredibly rich and beautiful, and much of it can be seen by snorkeling at depths of just a few meters. Even if you’ve seen colorful coral reefs elsewhere, the number and variety of fish here will astound you. Because the water absorbs so much red and yellow light, most of the underwater world is monochrome blue below about five meters, so snorkeling gear is all you need to see some of the best of it. Some islands are much better than others for snorkeling, so if this is a big attraction for you, select your resort with this in mind. Usually, an island is surrounded by a sand-bottomed lagoon, then the ‘reef flat,’ a belt of living coral covered by shallow water. At the edge of the reef is a steep, coral-covered slope which drops down into deeper water. These ‘reef slopes’ are the best areas for snorkeling. The slope itself can have interesting features like cliffs, terraces, and caves, and there are visible changes in the coral and other marine flora as the water gets deeper. The smaller fish which inhabit the reef flats can be seen, as well as the larger animals which live in the deep water between the islands but come close to the reefs to feed. The best islands for snorkeling have narrow reef flats with lots of channels through to the outer reef slope. Some resort islands, however, have very wide lagoons and extensive reef flats – you may have to swim hundreds of meters to get out there, and you still won’t be able to get across the shallow reef flat to the edge where the reef slope is. (Remember that you are not allowed to walk on the reef or damage the coral, and it’s so sharp that you wouldn’t want to anyway). In some cases, there will be entrance channels which you can swim through – these are usually natural channels, sometimes widened and deepened a little to permit boats and snorkelers to get in and out of the lagoon. You should always use these channels rather than try to find your way across the reef flat. Another option is to walk out on a jetty to the reef edge – all resorts have at least one dock, though sometimes they don’t extend the right to the edge of the reef. If you’re keen on snorkeling, choose a resort where the deep water is not far offshore, at least around part of the island. Remember, too, that the ‘inner reef slopes’- those that face the sheltered water inside an atoll – are much more suited to snorkeling than the ‘outer reef slopes’, which don’t have a reef just offshore, you should be able to still do some snorkeling because they usually provide a couple of free boat trips or island-hopping excursions which top at really superb snorkeling sites, typically at a giri or near some uninhabited island. 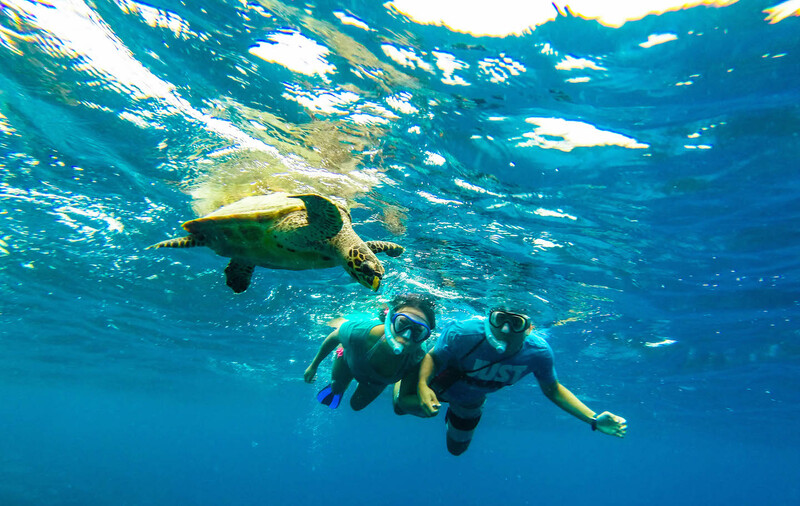 If you’ve never tried snorkeling before, you’ll soon pick it up, and many resorts give brief, free snorkeling lessons in swimming pools or shallow parts of the lagoon. Every resort will have snorkeling lessons in swimming pools or shallow parts of the lagoon. Every resort will have snorkeling equipment which you can rent, but this will cost extra. It’s better to have your own – it’s cheaper in the long run, and you can be sure that it suits you and fits appropriately. You can buy good quality equipment at reasonable prices at the airport shop and in Malé. Most resort shops sell them too, but the range is smaller, and the rates are higher. Ideally, bring your set from home. Typically, human eyes won’t focus on water, but a face mask keeps an air space in front of your eyes, so you can focus underwater just as well as the fish. Masks cost anything from $10 to hundreds of dollars and, with most things, you get what you pay for. All masks should have a shatterproof lens and make sure that it fits comfortably onto your face. To check if it fits well, press it gently onto your face without the strap around the back of your head. Breathe in through the nose, and the suction should hold the mask on your face if the fit is good. If you are short-sighted, you can get the mask lens customized to your optical prescription, but this is expensive. Alternatively, get a stick-on optical lens to attach to the inside of the mask lens, or just fold up an old pair of spectacles and wedge them inside the mask. You can wear contact lens’ with a mask, but there is the risk of losing them if the mask is flooded. The altered focal length of light underwater often compensates quite well for short-sightedness. A snorkel lets you breathe with your face down in the water. It’s merely a curved tube with a mouthpiece which you grip in your teeth. When you dive below the surface, the snorkel tube will fill with water, but you can clear it by blowing out forcefully once the snorkel tube has to be long enough to reach above the surface of the water but should not be either too long or too wide. If it is too big, then you have more water to expel when you come to the surface, and it’s not pleasant to find that the first gulp of fresh air is mostly seawater. Also, each breath out leaves a snorkel full of used air. Usually, this only dilutes the fresh air you breathe in, but if the snorkel is too big, you will breathe in a more significant proportion of carbon dioxide. Fins are not necessary, but they make swimming more comfortable and let you dive deeper. Fins either fit entirely over your foot or have an open back with a strap around your heel. The former type must fit well, while the latter type can be adjusted, and can be designed for use with wet-suit boots. Boots will make the fins more comfortable and are useful for walking over rocks and rough surfaces but remember not to step on coral reefs even if your feet are protected. 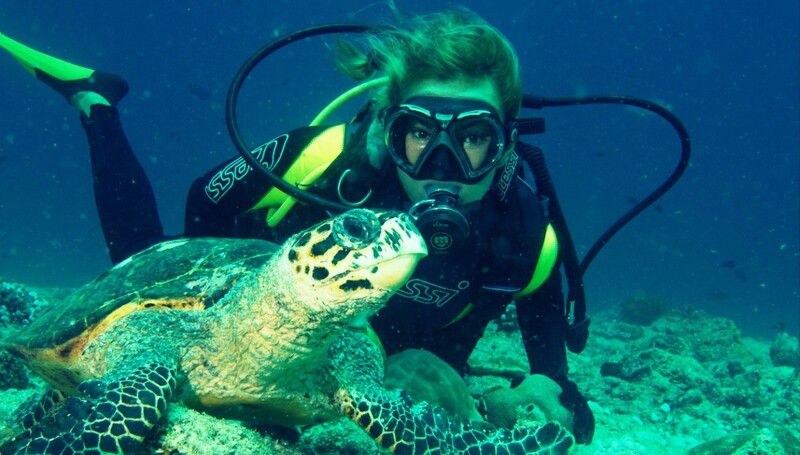 Scuba diving is the main attraction in the Maldives and its estimated that over 60% of visitors do some diving. Some resorts are hard-core divers’ centers where up to 90% of guests will dive. Even among honeymoon couples, up to 50% will go diving, which must say something about how good the diving is. 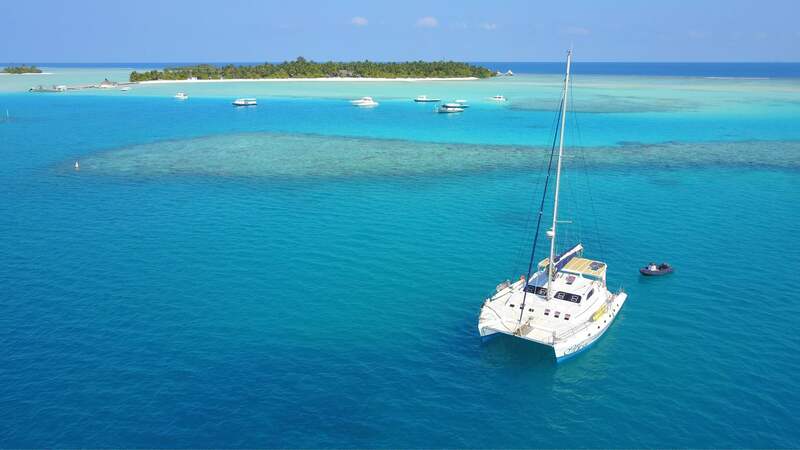 An alternative to resort-based diving is to charter a live-aboard boat and do a diving safari trip, diving at sites which are beyond the reach of any resort. There are hundreds of recognized and named dive sites, and dozens accessible from nearly every resort, but some resorts may be better located for particular types of diving or at different times of the year. Most resorts have catamarans for rent and will give lessons for beginners, but it’s quite expensive – around US$35 per hour for rental, US$50 with lessons. It’s cheaper by the day or week, but for a lot of sailing, you should budget US$300 – US$350 per week. Even if you don’t need it, you may have to do at least one lesson to convince the staff you’re a safe sailor. The boats are usually Hobie Cats or Top Cats, with fiberglass hulls and two sails – no trapeze or spinnaker. Most resorts offer windsurfers for rent, as well as windsurfing lessons, but the Maldives is not an ideal windsurfing destination. The lagoons around most resort islands are shallow and sheltered, and although this usually makes for a good beginner’s area, falling off a windsurfer in half a meter of water over a coral reef can be painful, or even dangerous. Some of the lagoons are large enough for experienced windsurfers to enjoy, but winds are usually under 15 knots, so it’s not super challenging. 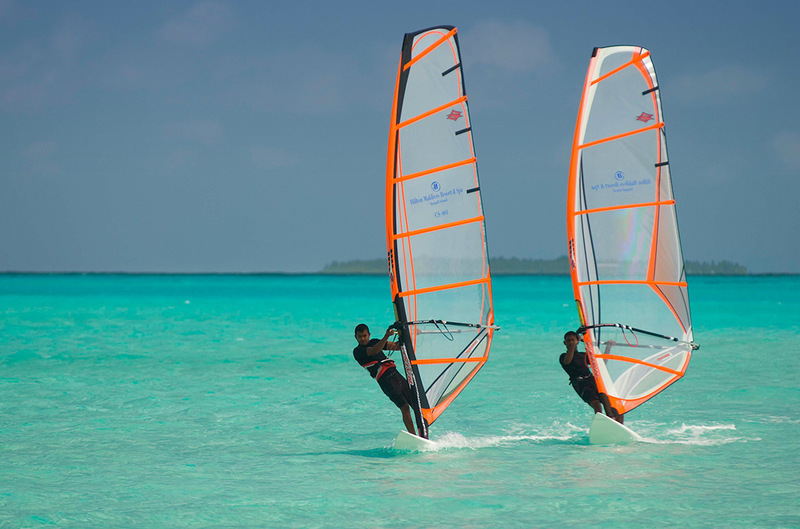 Mistral, the French windsurfer manufacturer, has a windsurfing school and test facility at One&Only Reethi Rah resort in North Malé Atoll. There is some great surf in the Maldives, though there are only a small number of accessible breaks in the tourist zone and they only work from March to November. Surfers have a choice of basing themselves at a resort and taking a boat to nearby breaks or arranging a live-aboard safari cruise, which will take them to less accessible areas. In either case, it’s a good idea to make arrangements in advance with a reputable surf travel operator who knows the area well. The Maldives is not the sort of place where a surfer can just turn up and head for the waves. The period of the south-west monsoon (May to November) is the best time to surf with the best waves, but March and April are also good and have the best weather. June can have bad weather and storms, and it is not great for boat trips, but it is also a good time for big swells. Most of the surfing season is a quiet time for Maldivian resorts, so surfers can come when accommodation is cheaper. The best breaks usually occur on the outer reefs on the south-east side of the atolls, but only where a gap in the reef allows the waves to wrap around. Surfing in the Maldives was pioneered by Tony Hussein (aka Tony Hinde), a Sydney surfer who was shipwrecked in the Maldives in the early 1970s. Before the first tourist resorts were opened, he discovered, surfed and named all the main breaks, and had them all to himself for many years. Game fishing is done on the open sea between the atolls and requires a fast, modern boat and some specialized equipment. It’s an expensive activity and usually involves a maximum of four passengers to share the cost. The main species of fish are yellow fin tuna, sailfish, blue and black marlin, barracuda, wahoo, jackfish, shark, and dorado. 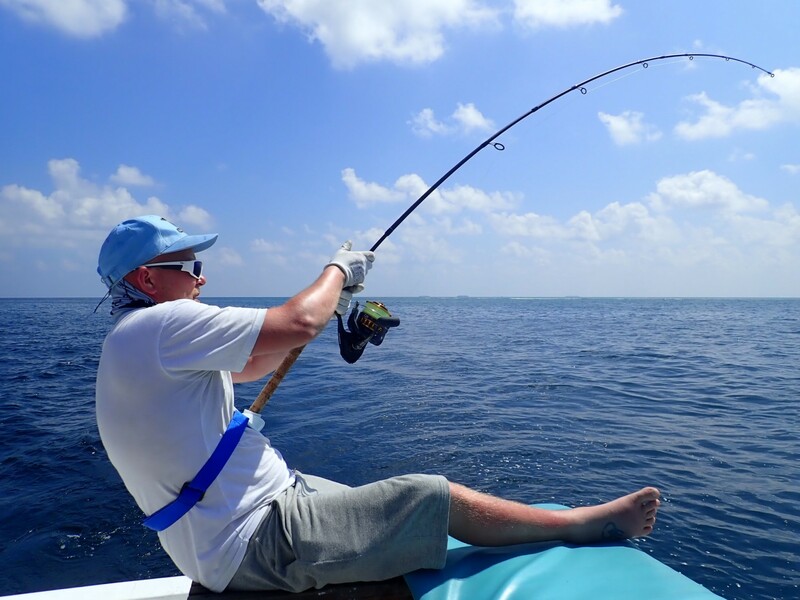 The policy of the Maldives game fishing industry is ‘tag-and-release,’ especially for bill fish such as marlin and sailfish, make sure you bring a camera along if you plan to make a record-breaking catch. 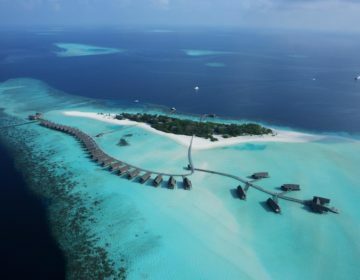 Resorts which arrange game fishing trips include Baros, Sheraton Maldives Full Moon Resort & Spa, Kurumba, Laguna, Nakatchafushi, and others. 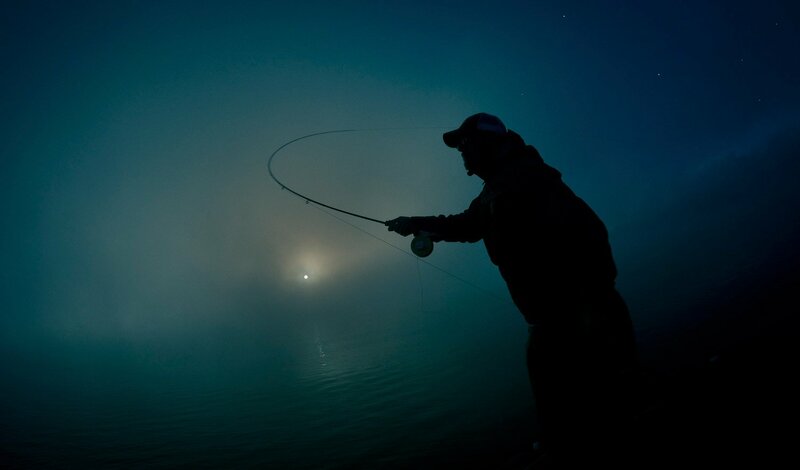 Most resorts organize regular night fishing trips. Usually, about a dozen people go out in a dhoni for two or three hours with a hand line each and bucket full of bait. On a typical evening, you would expect over 80% of them to catch something, and everyone would get a few nibbles. Apart from the numerous reef fish which go for the bait, you can catch barracuda and, if you’re trolling, tuna may take an interest. You can usually arrange to have your catch prepared by the resort’s chef. Canoes, usually fiberglass touring kayaks, are available at most resorts, from about US$10 per hour. It’s a great way to look around the lagoon, but you’re not usually permitted to take them on a long trip, or to another island. To some extent, this is for safety reasons, in case you hit a reef or get caught in a channel, but it’s mainly to restrict access to other islands. Beware of the sun and heat – wear a hat and avoid paddling in the middle of the day. 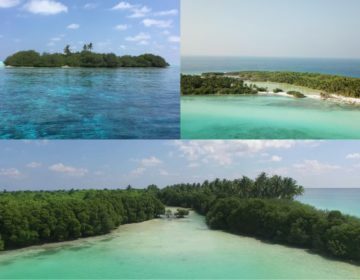 At least one group has explored the possibility of extended sea kayaks through some atolls outside the tourist zone, but these would be very much special expeditions requiring approval from the Maldivian authorities. 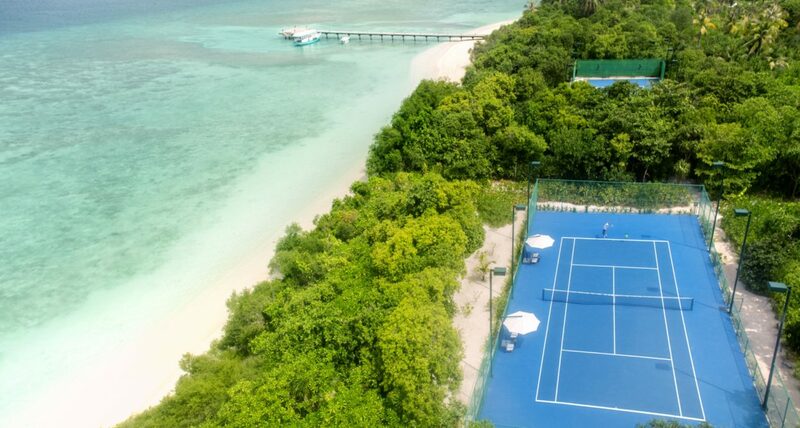 Quite a few resorts have tennis courts, sometimes included in a package, but usually subject to an extra charge per hour, and often more at night. Sometimes rackets and balls are rented separately, for an extra fee, so if you are a keen player, bring your own racket and balls. 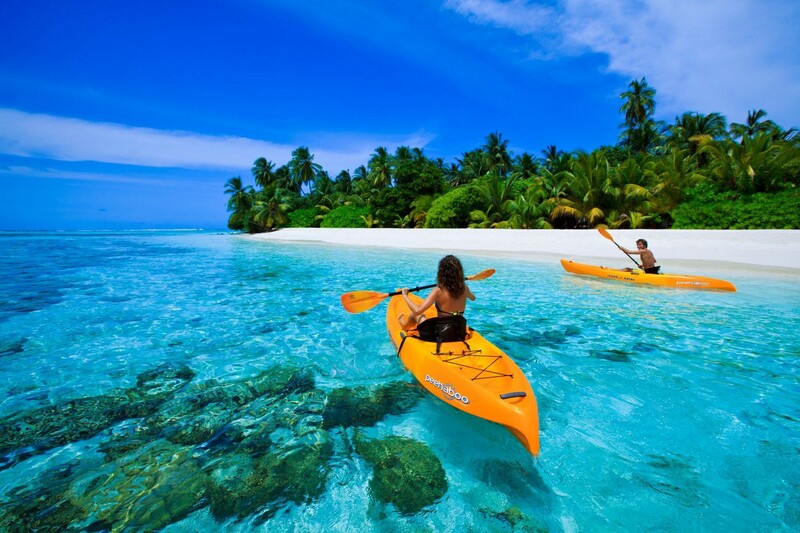 There are several other activities on various resorts around the Maldives. Those involving power boats are pretty pricey. 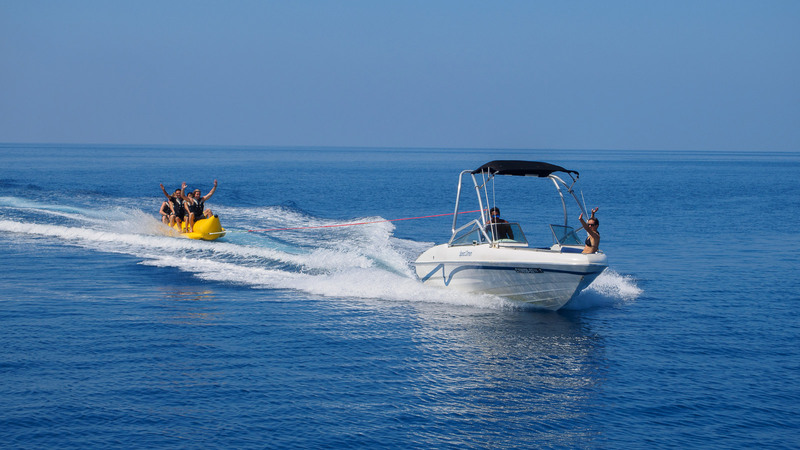 For example, there is the ‘banana boat’ ride, where half a dozen or so guests climb onto a giant, inflatable banana and get dragged around the lagoon by a speedboat. Water-skiing is available on some islands at an extra cost, as well as parasailing and jet-skiing. Generally, the powerboat activities don’t seem to be that popular, which is a great blessing for those who want to sit quietly on the beach.